Video and Photos Meteorite crash in Russia A series of explosions in the skies of Russia’s Urals region, reportedly caused by a meteorite shower, has sparked panic in three major cities. Witnesses said that houses shuddered, windows were blown out and cellphones have stopped working. According to unconfirmed reports, the meteorite was intercepted by an air defense unit at the Urzhumka settlement near Chelyabinsk. 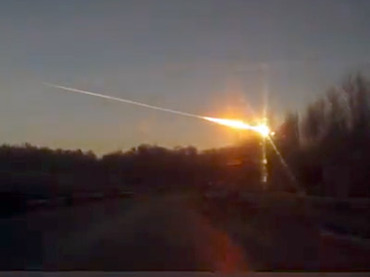 A missile salvo reportedly blew the meteorite to pieces at an altitude of 20 kilometers. A meteorite is a solid piece of debris from space objects such as asteroids or comets, ranging in size from tiny to gigantic. Up to 150 people sought medical attention as a result of the incident, according to the Russian Interior Ministry. No serious injuries have been reported, with most of the injuries caused by broken glass and minor concussions. Office buildings in downtown Chelyabinsk are being evacuated. Injuries were reported at one of the city’s secondary schools, supposedly from smashed windows. The regional Emergency Ministry said the phenomenon was a meteorite shower, but locals have speculated that it was a military fighter jet crash or a missile explosion. “According to preliminary data, the flashes seen over the Urals were caused by [a] meteorite shower," the Emergency Ministry told Itar-Tass news agency. Residents across the Urals region were informed about the incident through a cellphone text message from the regional Emergency Ministry. Many locals reported that the explosion rattled their houses and smashed windows. Evgeniya Gabun wrote on Twitter. 2 Komentar untuk "Video and Photos Meteorite crash in Russia"